The Grand Final long weekend is a busy one for Uncle Bobs, with the selling of Premiership Posters. 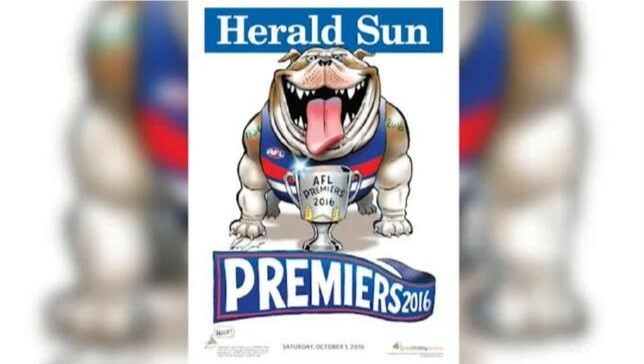 On Grand Final day, volunteers from Melbourne and Craigieburn had an anxious wait, and then a very busy evening as swarms of passionate Western Bulldogs fans flocked from the stadium to buy their commemorative posters. The following day, the Bellarine Branch represented at both the MCG and Whitten Oval continuing the sales. With over 20,000 people at The Kennel, and some excellent spruiking from Bellarine’s own Wayne Wong, our two teams raised a combined total of $11,975.60, almost double the amount raised last year! UBC was very proud to hand over a total of $36,080.35 to the Good Friday Appeal, a very good head-start for the 2017 Good Friday Appeal! Thank you to all the volunteers who came along to roll, pack and spruik! We cannot do such wonderful work without you.